In 2004, Jimmy Moore lost 180 lbs on the Atkins diet. In September 2006, here was one week of menus. Now, you'll notice lots of meat, lots of "junk" laced product that he rails against these days. Lots of food. And what's that after every day's foods? EXERCISE. Not just any exercise, but cardio. He also weighed 219 lbs. 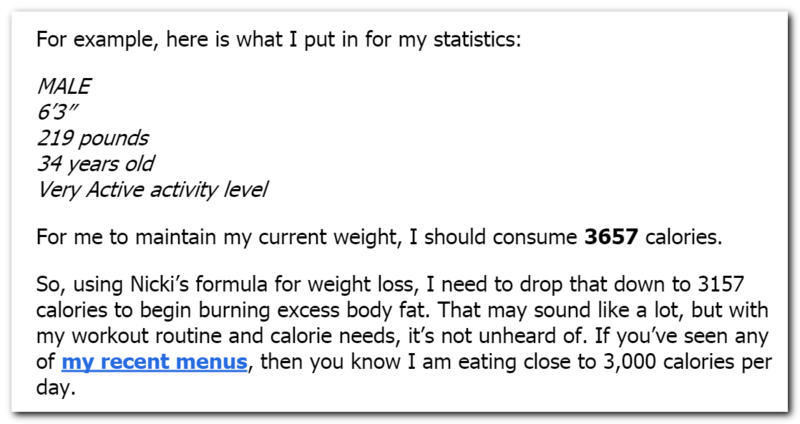 That's a post about a calorie counting formula courtesy of Charles in comments here recently. 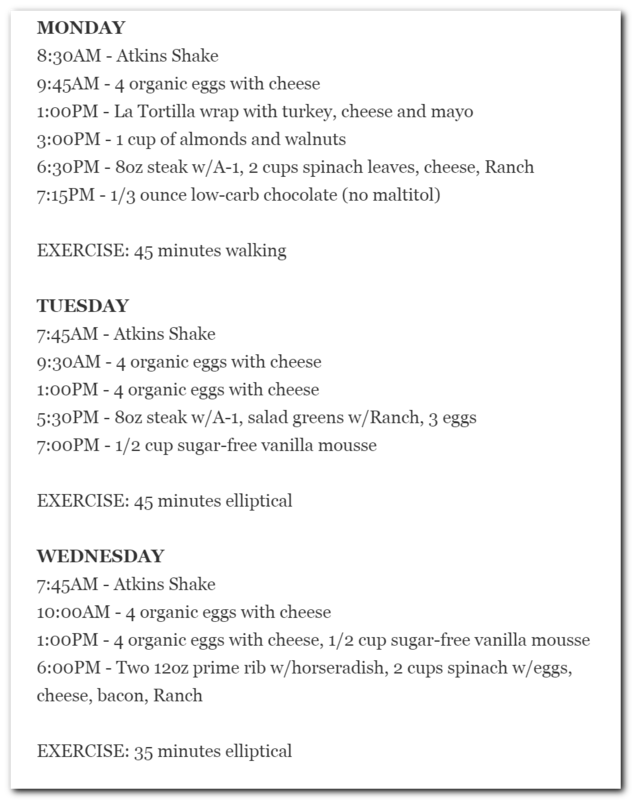 My normal caloric load is around 2100-2500 calories. I might have believed that for when he was losing his 80-ish pounds on his one-year NuttyK "experiment" from May 2012 through May 2013. But anyone who is not legally blind who has seen pictures of Jimmy since can see that he has regained most, if not all, of that weight. Yet he claims to be eating at those levels. Jimmy Moore is at it again lying about his diet, as his health, and the health of his wife, visibly deteriorates. I think it's a combination of the two. Being in chronic "metabolic starvation" has no doubt led to compensation in metabolic rate. Also restricting protein and limiting exertion to the occasional round of disc golf is not really working to build steaks-on-arms. But he has had to be in caloric surplus to regain the weight ... it makes no sense to speculate as to how. It just is, and he's a liar. That actually looks like it was a somewhat reasonable meal plan, though a bit short in the veggie and fruit department. He probably could have cut back on an egg or two since 3000+ calories per day was probably still too high to lose what he needed even at 6'3". Can only imagine where he might have ended up if he also threw in some weight training to properly leverage the caloric and protein surpluses. He may well have turned into a true beast. But promoting a more sensible low-carb diet plan is pretty boring and has much less profit potential. The picture with his egg/butter breakfast shows that he consumed 2000cal on his breakfast alone. A 300lbs man cant broke his metabolism so much. Deepest ever observed drop in metabolism was on the starvation experiments done by Keys and that was not more than 30%! Agreed that 3000 cal/day was probably above maintenance. But he was wildly optimistic about his activity level ... very active? Not even close. He also claims to have amazing energy whilst gaining weight on just 2100 calories a day. If his metabolism is that slow, he'd be freezing and tired. 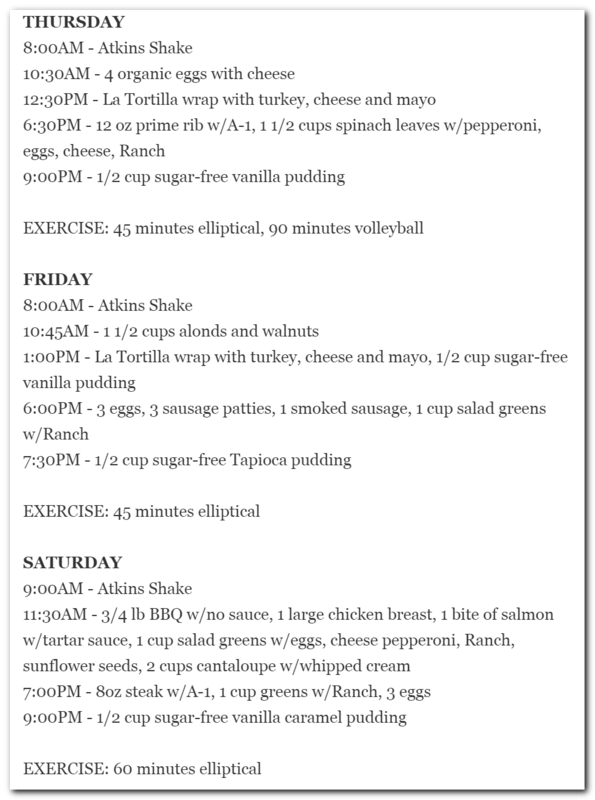 I do believe that activity level can make a startling difference in caloric needs. I used to use a bicycle as my only form of transportation and rode over an hour one way to work, not to mention any errands, and it was astonishing the amount of food I could pack away and still be immune to weight gain. When I had a sedentary job where I worked way too many hours and commuted by car, I could seemingly gain weight just by thinking about food. Oh my. Can't resist a comment. Juxtaposing past actions with decent measured results, with current affirmatory words and reverse results. Using EasyHits4U you can earn free advertising credits by visiting other website-ads from a member base of over 1,200,000 accounts. Earn credits fast with a 1:1 exchange ratio. New Diet Taps into Revolutionary Concept to Help Dieters LOSE 20 Pounds in Only 21 Days!